Click to see larger: Credit: CicLAvia. CicLAvia will be back in the Arroyo Verdugo region of Los Angeles County this Sunday with a three-mile route connecting tranquil Atwater Village to bustling downtown Glendale. Portions of Glendale Boulevard, Central Avenue and Brand Boulevard will be closed to cars and open to cyclists, pedestrians, rollers, zumba enthusiasts, strollers and all other forms of non-auto transportation from 9 a.m. to 4 p.m. Participants will have easy connections to the route by either the L.A. River Bike Path or the Metrolink Glendale Station (hit those links for directions). In order to accommodate more bikes, Metrolink will be providing an additional bike car on all Antelope Valley Line trains running throughout the event. The car-free event is funded by Metro through its Open Streets Grant Program, whose goal is to provide opportunities for riding transit, walking and riding a bike — possibly for the first time — and to foster civic engagement on transportation and infrastructure at the community level. Metro outreach staff will be on hand at the Brand Boulevard hub, so make sure to stop by for some Metro swag or to have any of your burning Metro-related questions answered. Due to street closures for the event, some buses will be detouring in the area. Please check Metro’s Service Advisory page for more information. To find alternative routes and connections, use the Trip Planner or call 323.GO.METRO. But will the “bike cars” have those bike-space-stealing surfboard nets that have helped reduce the bicycle space from 100% (before seats were re-installed) to 50% (after seats were re-installed) to now 33% of the original offered? It’s funded by Metro, but on the “getting there” page, no mention is made of using Metro at all. Lots on info on parking, though. It seems like a wasted opportunity that you’re not promoting the 501 which would get you right to the route from either the Gold line in Pasadena or the Red line in Burbank/NoHo. In fact, running a weekday schedule on the 501 would be even better. Seriously, promotion of transit should be one of the requirements of these open streets grants. The issue that concerns is that the buses have a limited ability to accommodate bikes — and this is an event in which the majority of people who participate are on bikes. We don’t want people having to wait and wait and wait to get a bus. JR is right. Encouraging people to explore non-automobile options of getting to Ciclavia (including, notably, metro) is half the point of the event. 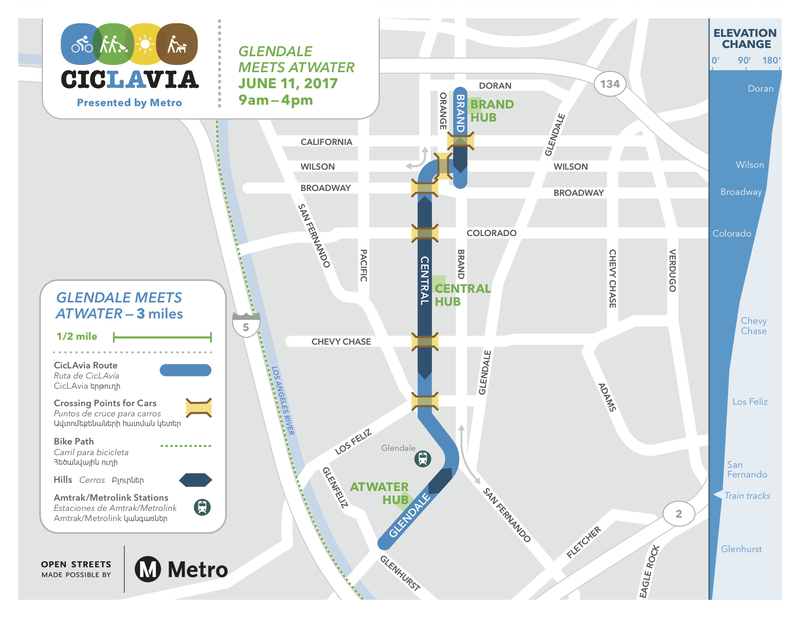 It is incumbent on Metro to encourage people to take metro to Ciclavia, and furthermore, to provide the best transit service reasonably possible given the fact that Ciclavia is a day to expose its services to new riders who are in a position to form a first impression of what riding Metro is like. Metro could also maybe bend their “no bikes inside buses” rule for one day, even if only for kids’ bikes. Which leads me to my next question. At the last non-metro-rail-accessible Ciclavia where there was a nearby Metrolink station (Pacoima/Van Nuys Ciclavia in March 2016), the ridership on the Metrolink trains was close to zero. I took Metrolink from downtown Burbank to the route with a skateboard because I was afraid the train would be packed with bicycles loaded up at Union Station. First, the train was 2 hours late, and then when it finally came, quite the opposite was true. I don’t think I saw a single bicycle on the train in either direction. This time around, have Ciclavia and Metrolink done a more thorough job of advertising their service so that people realize Metrolink is a viable option for getting to/from Ciclavia this weekend. I realize Metro isn’t directly involved in this particular issue, but I pose the question nonetheless in case you have any insight. I’m not sure what the question is. The 501 has its challenges for an event that is popular for cycling, as I’ve explained. As for the second part, all I can say is that Metrolink — like Metro (which partially funds Metrolink) — is always looking for opportunities to grow ridership. Because neither Atwater Village or Glendale are on the Metro Rail network, this seems like an opportunity to provide a service that people may use to get to the event from Union Station or the Valley. Plus, commuter trains have a lot more room for bikes than buses.